I though about other aspects concerning screamer and sungem: why do they not work in g3beige?Realtek network device works in g3beige while sungem doesn't (the device is present but "the cable not plugged").Where can be the reason?Sungem code doesn't seem to depend directly on architecture.May the reason be in difference of pci or pic code of g3beige platform? Last edited by alex195812 on Wed Feb 15, 2017 2:42 am, edited 2 times in total. I though about another aspects concerning screamer and sungem: why do they not work in g3beige?Realek network device works in g3beige while sungem doesn't (the device is present but "the cable not plugged").Where can be the reason?Sungem code doesn't seem to depend directly on architecture.May the reason be in difference of pci or pic code of g3beige platform? I haven't paid much attention to the g3beige target in a long time. Maybe the poor audio and g3beige failure of screamer are related. I remember hearing that Ben H.'s repo fixes the erratic mouse issue in Mac OS 9. This makes me wonder what else has he fixed. Maybe we should try porting screamer to Ben's mac99p target and see what happens. I thougdt about it at the time I tried to combine the possibilities of Ben's and Mark's repos.But I met some things I wasn't sure how to deal with. I didn't know how many irq's are aloowed.Don't know why but I seemed that no more than 8 (maybe a superstition? ).Adding screamer to ozbenh source makes the number equal to 10 (screamer takes 3) and some values should be changed and I wasn't sure how exactly. Though I added support for screamer into Ben's openbios version (I didn't post it on the forum).It isn't hard but the resulting version has the same isuue of losing ability to boot OS 9.0.I thought the problem was in regs assigned to screamer in openbios(now I think the regs are onboard registers). It's also easy to add vga support for OldWorld in Ben's qemu version(I still have such version not processed by Macpack). I also think it makes sense to port Ben's mac99p patches to a newer qemu version(2.8.0 or 2.9-dev). And I wonder if adb changes could be separated from PMU and applied to mac99 (or even g3beige?). Wow you already ported screamer to Ben's mac99p. Great. You lost 9.0. Is it able to boot 9.1? 9.2? Mac OS X? How does it sound? Any improvements? I found this source. It says there could be support for 128 interrupts. No,in fact.I added screamer support to Ben's openbios only.The second part is to add mcayland's patches to qemu itself(and it seems not quite easy to me). But adding screamer to openbios is enough to break OS 9.0 boot (if vga patch is applied to qemu binary).I didn't try 9.1,but 9.2 works (installed system),though booting installation cd is also problematic.That's why I uploaded two openbios versions(with and without screamer) with the latest (Jan 10) qemu build. OS X seems not affected at all. Can anyone tell me, or point be to, how to build Openbios, when I build Qemu-PPC?? Last edited by Cat_7 on Wed Feb 15, 2017 10:16 pm, edited 2 times in total. Your saying no sound improvements with mac99p? It does still play sound? I added screamer support to Ben's openbios only.The second part is to add mcayland's patches to qemu itself(and it seems not quite easy to me). Is adding Ben's mac99p code to QEMU something we should do? I know it boots Mac OS 10.5, but what other benefits does it have? I meant that I didn't completely add screamer to mac99p,only in openbios,so I don't know if it would benefit somehow for sound. Generally,it would be surely fine to add mac99p to qemu,especially for the benefits in adb work(e.g. 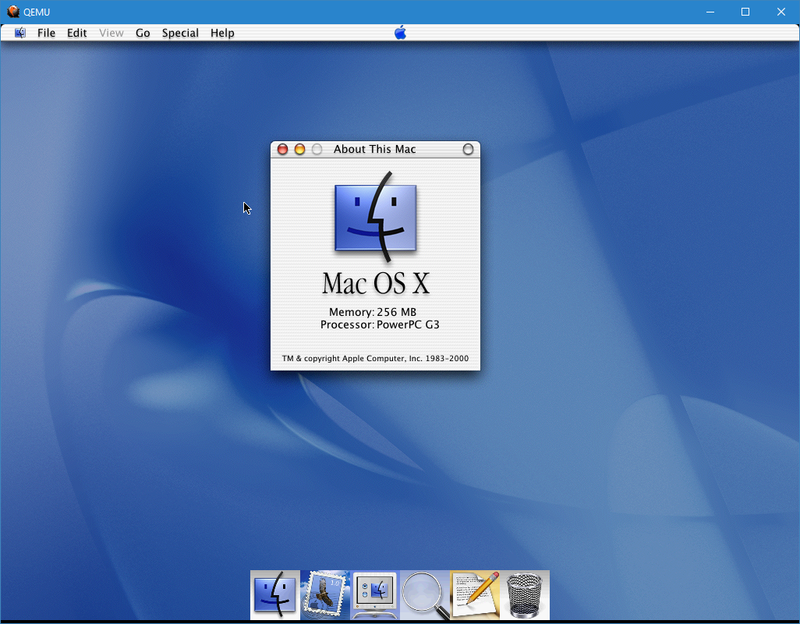 in OS 9 or 10.5).Though 10.5 may work in mac99 with usb mouse and keyboard. But the most desirable IMO would be to expand the adb improvements from mac99p to mac99 and g3beige. Also it seems important to figure out how screamer conflicts with vga during OS 9.0 boot and how to resolve it. I think screamer builds never booted OS 9.0.4. That is a regression Mark is planning to look into. Interesting... because according to Alex, it's the OpenBIOS changes that break the booting, not the qemu changes. So maybe Mark doesn't actually have anything to track down on the qemu side? Or were you saying he was looking into the OpenBIOS side of things? I don't know whether the problem is qemu or openbios related. Screamer requires changes in both. I was able to download the file when I clicked on the above link. I think trying a different (more up to date?) browser might help. That is because I fixed the link See some posts above. In fact,Mark's original version(qemu+openbios) does boot 9.04(though with some difficulties).I wrote about it on Jan 06. Appying Ben's vga patch for qemu to mcayland's version breaks OS 9.0 boot..
Generally,the break appears with combination of screamer-enabled-openbios+vga-enabled-qemu. For example,if I use a screamer-enabled openbios with Ben's qemu-wip,it appears,too. Ben's vga patch for openbios (not qemu itself) has been upsteam for several months,by the way. Thanks, Cat_7, that worked great. DP2 does work(installation OK,installed system rather unstable due to frequent LoginWindow errors).What qemu/openbios versions did you try?Official qemu versions don't work with DP2,so a version from this forum is needed. Pardon me but isn't gsoc over now? The result however is that you can dig through this thread to see the entire process of qemu booting OS 9 from "no idea how to make it work, but let's start investigating it at GSOC" to the point it's at today. We should probably end the thread when it finally overcomes the hardware issues and we can boot Mac OS 8.6. I'd also like to note that Mac OS X DP3 crashes when trying to boot from it's CD in the latest Windows build. This happened when I was both emulating a G3 and G4. Can you say me what did you do, please? I think that the root of this bug has something to do with the following. Screamer is not a "native" device for mac99,it is from g3beige(it's ironic that it currently doesn't work in g3bege).And probably the resources assigned for this device(taken from g3beige dev tree) are unappropriate for mac99.It seems that for mac99 other regs(and/or something else) should be assigned to avoid conflicts.It's surely too abstract yet. Any good news on Server, and the 4 DP's? I did more sound tests in QEMU. This time I tried playing audio files in Quicktime player 7 on Windows 2000 in qemu-system-i386. The audio would play well for a while, then just drop. There is something about QEMU that Quicktime has a problem with. If I pause then play after a drop, the audio starts playing again. That might be a buffer running out of data, then filling up enough to start again. The sound quality when playing is really good. When I run "x/10i $pc" in the monitor to see what instructions are running, I do see a lot more floating point instructions than I see with Microsoft's audio playing software. Microsoft's software does play audio files without a problem. The sound card I used in all these test is AC97. One or more buggy floating point instructions. Too slow a floating point unit. Assumptions Apple made about hardware that are not so in QEMU. My CPU is a 7 year old Core 2 Duo. If anyone has recent hardware they could share their audio playing experience with, we could appreciate more data. That reflects what I've seen under OS X on a 2015 15" MacBook Pro with discrete AMD Radeon R9 M370X. Processor in that is a quad core 2.8GHz Core i7-4980HQ (Haswell). Based on that, I don't think the issue is the Host CPU; I'm not getting any performance issues in the emulation or in other software while the emulation is underway. It doesn't even peg a single CPU, and if I renice the process to max out CPU usage, the sound problem persists in the same way. Throttling the CPU also has minimal effect (causes a bit of stuttering in the sound and jerky video, but the "play, then drop" issue stays the same). Ok for the buggy FPU, I'm think there must be a program somewhere that test it. Any suggestions anyone? If there isn't, one would have to be built. This would probably involve assembly code. I have successfully made x87 and PowerPC floating point assembly code. But since our host computers are x86, I'm thinking testing the qemu-system-i386 system for floating point bugs might be easier. A test program could be made on our host systems, then just ran in qemu-system-i386 to compare results. The "too slow floating point" theory might be trickier to solve. If this is the case, one way to solve it that comes to mind is to use x87 assembly language in QEMU's source code. Since around 95% (my estimate) of QEMU users are on x86 hosts, this might not be a problem. The remaining users could just stick with the C implementation. For the last theory about Apple assumptions, I'm not sure what to do. Apple has made a lot of their code open source, but not all of it. Quicktime is what I am wondering about. It is definitely doing something that doesn't work well on QEMU. The only hints I have are the assembly language code I see QEMU running. Does anyone know where to find Quicktime's source code?